Wedding bells are ringing in the K-popiverse! As many of our readers will have heard, Wonder Girls‘ leader Sunye will be tying the knot with one James Park, a Korean-Canadian who has been the singer’s boyfriend for the past two years. This announcement comes almost exactly one year after Sunye publicly acknowledged her relationship on an episode of Strong Heart; the two met while doing missionary work in Haiti and will be wed on January, 26, 2013. While JYPE has acknowledged that Sunye will still remain a part of the Wonder Girls and that the marriage is not indicative of a disbandment, it appears that she will take some time to focus on her new married life while the other members concentrate on individual activities and solo efforts for a bit. Importantly, the agency has given Sunye their blessing and fellow member Ye-eun has taken to social media to announce her well wishes for Sunye and her fiancé. Sunye is admittedly a bit young to be getting married in this day and age; as the average age at marriage increases in many countries, Sunye will walk down the aisle at just 23 years old (her fiancé is reportedly five years older than she is). However, I can think of no other individual active in Korean entertainment today who deserves to have a beautiful wedding and start an equally beautiful family more than Sunye. Sunye has one of the most tragic personal histories of any celebrity: her mother passed away when she was young, and due to the fact that her father suffered from a chronic illness that left him unable to care for her, she was raised by her grandparents. Her grandfather passed away in 2007 shortly before the Wonder Girls began promotions for their hit song “Tell Me,” and her father tragically lost his battle with illness in 2010. Sunye has endured more than any young woman should have to, and this writer is of the opinion that she fully deserves the chance to build a family with the person she loves, regardless of what anyone says or thinks. Of course, the news of Sunye’s impending nuptials has touched off a firestorm of mild hysteria among fans and non-fans alike. This is not to say that the reaction has been all negative; many have responded respectfully and with blessings for the new couple. However, as with any K-popiverse-shattering piece of news, some have lost their heads and started a slew of totally half-baked rumors. The most ridiculous of these would likely be the “theory” that Sunye is knocked up and therefore having a shotgun wedding (easily dispelled by JYPE and, quite frankly, anyone with a shred of common sense; that Sunye is deeply religious is fairly common knowledge, and while this does not necessarily preclude her getting pregnant out of wedlock, it’s disrespectful and totally out of left field to levy such an accusation against her — not to mention sexist, as men in K-pop have definitely had shotgun weddings without much fanfare or criticism). Another rumor would be that Sunye’s wedding somehow foreshadows the return of inactive member Sun-mi, who halted her activities with the group in order to focus more on her studies. This rumor is perhaps less unfounded; after news of Sunye’s wedding broke, Ye-eun, Yu-bin, and Sun-mi held an online chat session with fans and promised to return with good news soon. However, JYPE has shot this down as well, saying that they are “not sure where people are getting [this idea] from.” While that statement is obviously ridiculous, Sun-mi’s return is apparently not the good news that fans can expect. But perhaps the most oft-raised questions and speculations deal with what Sunye’s role will be in K-pop from here on out. It is true that Sunye’s marriage is somewhat groundbreaking in Korean entertainment; while many celebrities are married or in serious relationships (Han Ga-in, Tablo and Kim Hae-jung, Jun Ji-hyun, Simon D and Lady Jane, SES’ Eugene, and Kim Tae-woo, to name just a few), very few have married at the zenith of popularity and while still actively promoting. Even more rare is a marriage involving an idol from a popular group; in fact, Sunye is likely the first to break down this barrier and remind all of us that idols are, at their core, people with lives, loves, and desires outside of those that involve standing on a stage for our entertainment. Indeed, Sunye’s upcoming marriage does call into question not only Sunye’s ability to lead and promote consistently with the Wonder Girls, but also her ability to fulfill the unspoken obligations of idols to be available — literally and figuratively — to their fan base. To address the first, Sunye’s intended does not and has not lived in South Korea — and while the wedding will apparently be held in Seoul, there is no guarantee that the couple will continue to reside there. 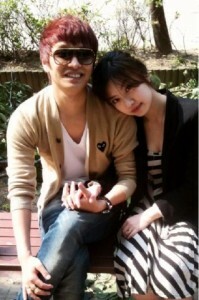 In fact, it seems as though Sunye will return to Canada with her new husband for at least a period of time. Sunye even said once that she would be willing to move to Haiti with him were it to come to that. But the concern goes beyond location and physical proximity to South Korea; as someone’s wife, Sunye will understandably have to divide her time and energy between both her career and her family. While every woman (and man) does this once they enter into a serious and committed relationship, very few people have careers that are as demanding as is Sunye’s. The idol lifestyle is far more contained and controlled than is the lifestyle of, say, an actor; idols suffer grueling schedules that can involve 4+ performances in a week, not to mention practice time, variety show commitments, and other scheduled activities. Part of the reason that companies house idols in dorms is simply because it makes it easier for management to keep track of them and schlep them around all day. Whether or not Sunye will be able to fulfill the obligations of being an idol performer remains to be seen — and while news of her engagement is intended to be celebrated with happiness, it appears that many fans are filled with anxiety that Sunye’s marriage marks the beginning of the end for the Wonder Girls (or at the very least, signifies yet another lineup change for the group). But it goes even deeper than that. As my talented fellow writer Nabeela expressed last week, the idol machine does to a certain extent operate on the idea that the idols are marketed directly to fans as being intended to fill whatever void the fan would like them to — and very often, that void is in some way a romantic one. Fans are led to believe, by a series of clever marketing tactics, that they can selfishly hold onto idols as their own possession. Perhaps one of the reasons that so many idols (and their companies) are reluctant to admit when they (or their artists) are involved in a romantic relationship is because it effectively removes them from the metaphorical (and literal) market; how can fans imagine themselves frolicking on the beach at sunset with their bias if their bias is known to be frolicking on the beach at sunset with someone else? A relationship certainly decreases the emotional “availability” of an idol, but marriage removes this availability entirely — and it tends to drag the idol in question physically away from the public eye as well. Put simply, a married idol is just not as marketable as is an unmarried one. As Nabeela points out, this puts the onus on idols and companies to ensure that their idols remain single at least in the headlines for as long as possible. In addition to all of this, Sunye’s marriage is a startling reminder that the second generation (if you will) of major idol performers (those who debuted in or around 2005) are growing up and getting older — and in the process, moving on to different phases of their lives. People have been saying that Girls’ Generation and the Wonder Girls cannot be girls forever for years now, but reality hits hard when the girl in curls (and hideous blue eyeshadow) from the “Tell Me” music video dons a wedding dress for a non-promotional purpose. Idols may continue their careers, but they won’t always be there as we imagined they might be — and for many, this is a possibility that is difficult to swallow. However, it’s a good lesson in growing up — and given that the occasion is something as wonderful as a marriage, fans would do well to quash their emotional attachment and be happy for a woman who has served admirably as the leader of one of South Korea’s most famous girl groups for the past six years and will likely continue (in some capacity) to be a positive force in the K-idol community. We here at Seoulbeats offer our best wishes and a hearty congratulations to Sunye and James — and we can’t wait to see THE DRESS! What about you, dear readers? What do you think of Sunye’s engagement?